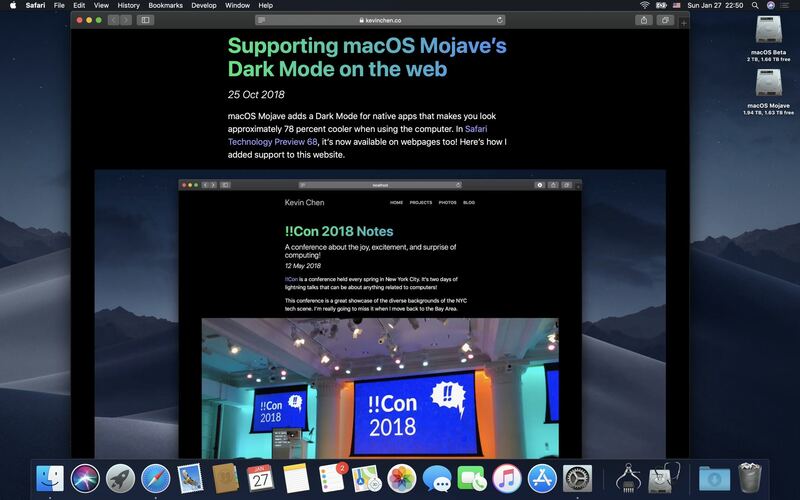 Safari on the macOS Mojave 10.14.4 beta, which was released last week, permits websites to automatically adapt their styling to complement Mojave’s dramatic new Dark Mode. 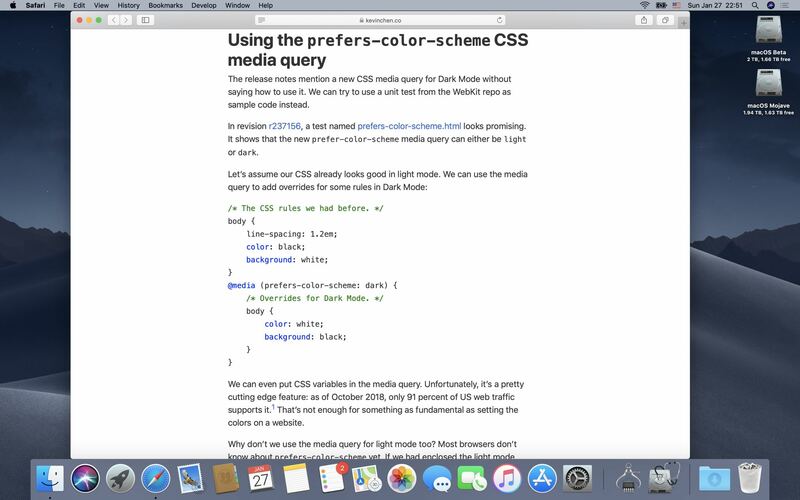 Apple in October put out Safari Technology Preview 68 with support for the prefers-color-scheme media query for styling dark mode content. This experimental feature’s now made its way into the Safari browser that ships in the macOS Mojave 10.14.4 developer beta. This super-useful feature can be manually enabled or disabled in Safari’s Develop menu under Experimental Features → Dark Mode CSS Support, as shown top of post. However, That option is nowhere to be seen in the current macOS Mojave 10.14.3 software. …but on MacOS Mojave 10.14.4 they automatically adapt to OS appearance. When macOS Mojave 10.14.4 releases, turning on Mojave’s Dark Mode in System Preferences will now change the styling on websites you visit accordingly. This will, of course, require web developers to implement black themes and adopt the new media query. 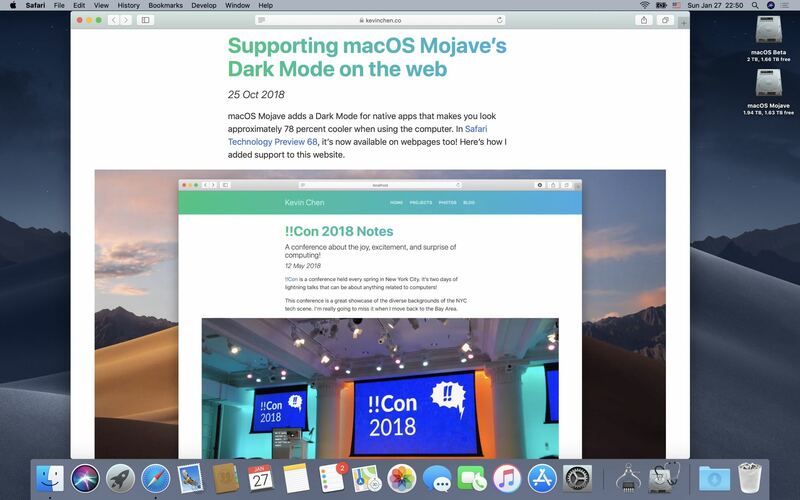 If you have the macOS Mojave 10.14.4 beta installed, you can try this out yourself by visiting Kevin Chain’s example webpage, then switch between Light and Dark mode in System Preferences to see the website automatically apply an appropriate theme. Again, this does not work in Safari on macOS Mojave 10.14.3 and earlier. A white webpage looks out of place when Dark Mode in the current Mojave version is on. Safari Technology Preview gives you an early look at upcoming web technologies in macOS and iOS. 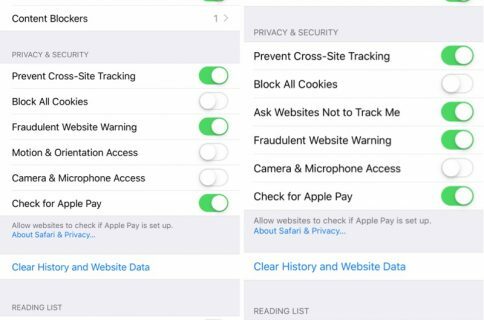 Anyone can install it alongside the regular Safari and use them interchangeably. This looks more like it, however. Courtesy of Safari on macOS Mojave 10.14.4. The biggest annoyance with Mojave’s Dark Mode currently is Safari’s lack of support for the new media query. With macOS Mojave 10.14.4, Apple’s web browser will finally be able to allow websites to automatically cycle their styling for Light and Dark system appearances. 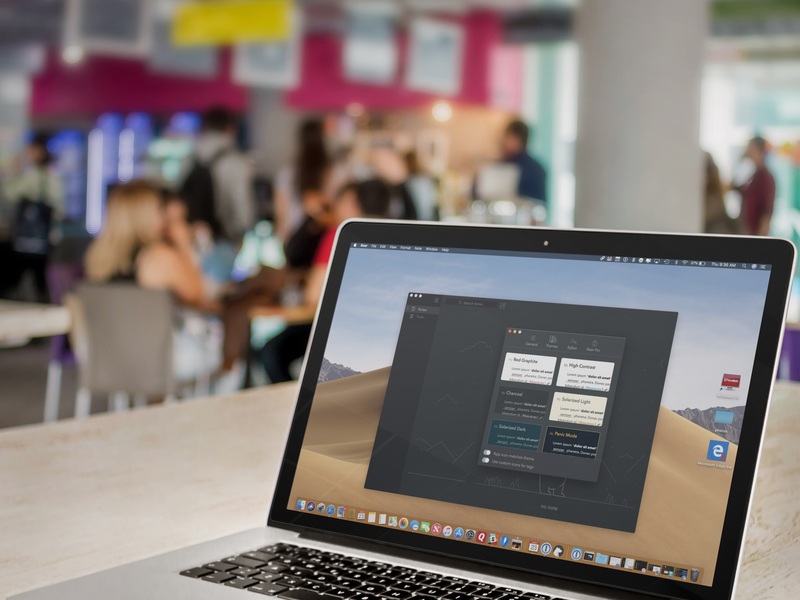 Dark Mode in Mojave transform your desktop into a darkened color scheme that puts the focus on your content. It changes the look of built-in apps like Mail, Messages, Calendar and more. An official API permits developers to do the same for their own apps. What you’ll find embedded below is a very cool comparison between automatic theme switching on websites when cycling between Dark and Light Mode in MacOS Mojave 10.14.4. Just drag the vertical slider to see it in action. 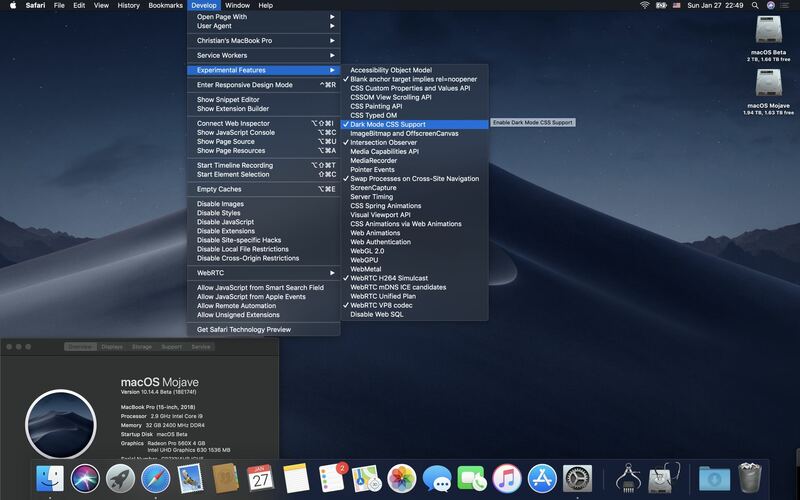 Since macOS Mojave was released to the public in September, numerous apps have added support for the system-wide Dark Mode, including 1Password, HazeOver, Spark and more. 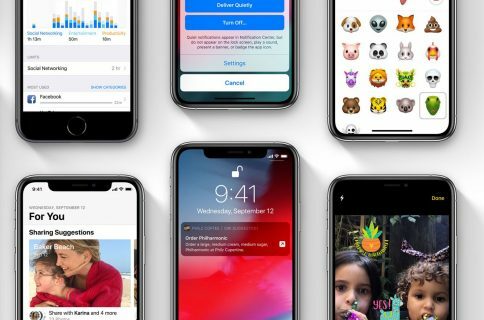 Dark Mode is officially unsupported on iOS, but a number of popular apps have adopted dark themes internally. 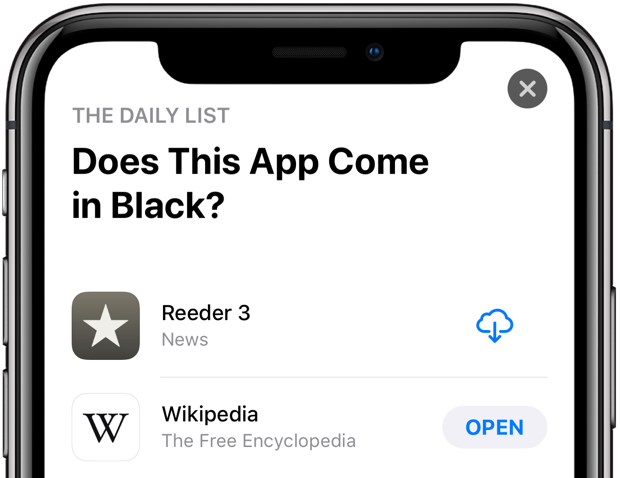 Because there’s no OS-level support for Dark Mode in iOS 12, users must manually turn on a darker interface in their favorite app, provided it supports it. Dark Mode in Bear Notes for Mac. 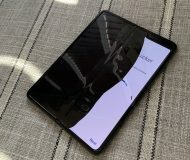 Be sure to check out Apple’s list of the top apps that feature darkened or pure black interfaces. A fan-made website over at Darkmodelist.com highlights more than 70 iPhone and iPad apps with custom dark themes along with screenshots. Apple’s App Store list of apps with black themes. 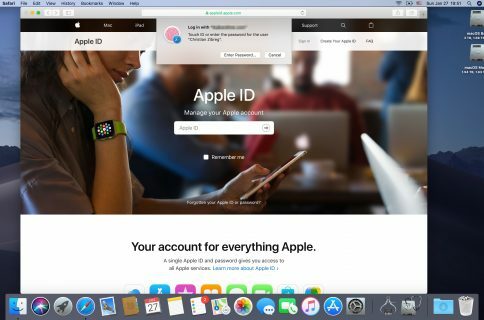 macOS Mojave 10.14.4 will also bring support for Apple News in Canada and the ability for Safari to automatically fill in your saved passwords with a touch of the Touch ID button. The software update should releases to all users in a few weeks. 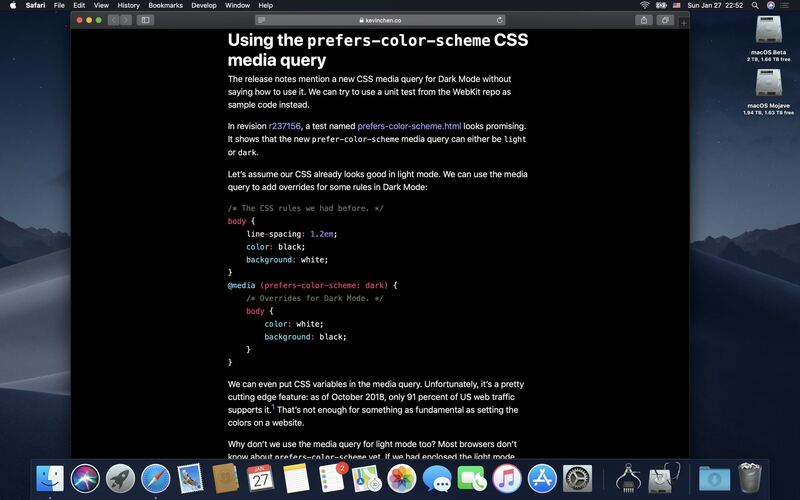 Are you looking forward to Safari’s support for Dark Mode styling on website? Let us know by leaving a comment down below!